From commercial office buildings to cultural institutions, there has been continuously strong growth for the use of dynamic glass in the building market. More recently, dynamic glass is also gaining popularity in airports due to the product’s ability to prevent heat gain and glare and provide a more comfortable traveling experience. Dynamic glass enables travelers to maintain views of the outdoors to be able to see take-offs and landings and provides airport staff with a work environment free from heat gain and glare. SageGlass has seen this trend first-hand and have recently completed two installations at the Minneapolis-St. Paul International Airport (MSP) as well as the King County International Airport in Seattle, Washington. Our first project at Minneapolis-St. Paul International Airport was a large east-facing curtain wall in Terminal 2 (formerly also referred to as the Hubert Humphrey terminal) in the lobby and auto rental area. More recently, we installed SageGlass in Terminal 1 (Charles Lindbergh terminal) as part of its north security TSA checkpoint. Electrochromic glass was specified by the project architect, Alliiance, with SageGlass being selected as the successful subcontractor for its ability to provide MSP employees with a more comfortable work environment since they would often experience distracting glare throughout the day. Along with benefitting their team members, this installation provides travelers with a more comfortable atmosphere, with views of the outdoors and access to natural daylight. We are currently working on the installation of the next phase of the Terminal 1-Lindbergh curtain wall with electrochromic glass, to be open in late 2017. 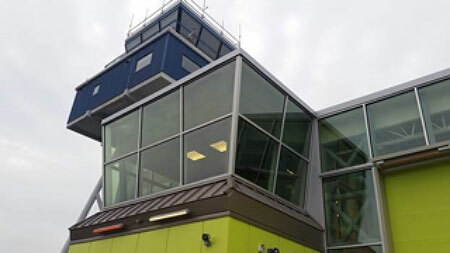 In Seattle, we installed SageGlass at the Aircraft Rescue and Fire Fighting Station tower at King County International Airport to provide employees with unobstructed views of the outdoors as well as a comfortable work environment free from heat gain and glare. At the airport, staff performs aircraft rescue and firefighting, law enforcement and airport safety inspections. Aircraft rescue and firefighting involves responding to aircraft emergencies as well as hazardous fuel spills and structure fires. Due to all of the important responsibilities of these commissioned officers, it is particularly important they work in a comfortable environment where they are able to focus and pay attention to the issues that may arise. Our dynamic glass helps to provide an environment conducive to their success. As demonstrated by these two completed airport installations, we are excited to see dynamic glass’ growth in the airport market and are hoping to continue to complete additional installations in this sector to allow our dynamic glass to truly reach new heights.